Definition: NSD Powerball is a finely engineered and precision crafted gyro consisting of a rapidly spinning rotor enclosed in a solid [hand held] outer sphere. 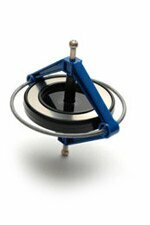 You set this rotor in motion using a cord or your finger and build its speed by subtle rotation of the wrist. It contains no motor or no batteries. All of the energy which we describe below comes from you dear reader and the stronger you are, the faster you will be able to make your NSD Powerball spin! ...and the faster you spin the inner rotor the more inertia it generates and the more resistance it subsequently inflicts upon the fingers, hands, wrists, arms and shoulders. All sounds basic enough I hear you say? In theory, it's quite a basic principle (the principle of precession - those magical forces emitted by a fast spinning flywheel) but in practice, it's an entirely different matter and one which has been responsible for the worldwide explosion in demand for hand gyro products - millions have been sold during the past 24 months alone. ...and there are all manner of them out there at the moment - ranging in price from the cheap and cheerful (mass produced gyroscopes which cost less than US$10.00) to the superlative hand built NSD Powerball range of products which we are offering here in their 250Hz format - the fastest and most perfectly balanced hand gyro range on earth - capable of reaching speeds in excess of 15,000rpm all powered simply by your own hand! These unique instruments generate massive force and put the shoulders, arms and wrists of the user under big pressure - making them ideal for fitness enthusiasts and virtually every kind of sport imaginable. And in addition, because the inertia (or gyroscope resistance) generated within the NSD Powerball is directly proportional to the speed at which you are spinning the rotor - these precision instruments are just as capable of gently rehabilitating a damaged limb (wrist breakage, carpal tunnel syndrome, RSI, tendonitis, tennis elbow, golf elbow etc.) as they are at building huge muscle in the arms and shoulders - its a completely non impact form of exercise and is all about rotor speed. Wow talk about a forearm and arm workout! It took a littletime to get used to the action required to get the speed up, but in no time I had got it above 11000 rpm. In a world of cheap imitation products, NSD Powerball sits at the very top of the marketplace with its superlative 250Hz movement - a creamy, silky, yet hard hitting spin that no other gyro can match! The best imitation products can reach speeds of between 6000rpm to around 9000rpm before the vibrations coming from the unbalanced rotor inside make it uncomfortable and impossible to spin any faster. At the heart of your new NSD Powerball however there beats a rotor that has been so precisely balanced using advanced computerised technology that it can reach speeds in excess of 15,000rpm without even the slightest vibration - at which point it is generating a staggering 40lbs of inertial resistance and hitting your arm and wrist a workout of monumental proportions! NSD Powerball took on a completely new dimension recently when a computerised digital counter was added to the outer sphere. This ingenious clock sits neatly at the top of the ball and accurately counts the number of revolutions performed by the rotor in a given run, helping you to monitor the improvements in your body strength on a daily basis. Soon after the counter appeared on the ball, we began receiving emails from NSD Powerball users asking us whether their "12,834rpm score was a good one or not"...or "how about my 11,422rpm... was that decent?" Thick and heavy they came until we realised that we had quite a hit on our hands and the world record scoreboard was introduced. Put a shiny new NSD Powerball down on a table in front of a group of guys (girls are just as bad!) and we absolutely guarantee that a battle will commence between them to find out just who can achieve the highest score with the ball. So whether you decide to purchase an NSD Powerball because you are a sports enthusiast who wants to make some serious improvements to your chosen game, a fitness enthusiast who wants to build or tone your arms, are suffering from a wrist disorder or simply want to enjoy one of the most addictive and entertaining new products to ever appear on the web, we encourage you to come on board and experience the extraordinary phenomena that is NSD Powerball for yourself - we promise a most unforgettable encounter!